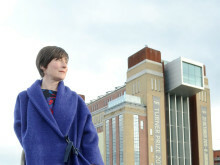 The combined £40,000 competition prize, sponsored by Northumbria law graduate and philanthropist Mr Wee Teng Woon, equals in value Britain’s biggest art award, the Turner Prize. Mr Woon was guest of honour at the award ceremony and presented the first prize to the winner. Holly Hendry, winner of the inaugural Woon Art Prize in 2013, was also in attendance to pass on her crown. Ramona, 27, said: “I can’t believe it! I feel very lucky to be chosen. I never expected to be shortlisted, let alone win! It’s the most amazing thing that could happen to me. I can now fully dedicate my time to working in the studio and not worrying about funding for materials. This is a dream for any artist. Originally from Poland, Romana moved to England seven years ago. Her work revolves around ideas of growth, ruin and the history exposed by these objects and architectural units as they interact with nature. The winning piece is composed of concrete and plaster planks that have living roots and seedlings embedded into them, growing out of the crevices and flaws in the structures. Ramona beat competition from nine other shortlisted artists to take the top prize, the Woon Tai Jee Fellowship. The shortlisted artists came from art schools and universities across the country and their art work encompasses a wide range of themes and mediums, including sculpture, photography, collage and animation. The Woon Tai Jee Fellowship is named after Mr Woon’s late father and earns the recipient a £20,000 bursary, use of the Woon Tai Jee studio space in the BxNU Institute of Contemporary Art at BALTIC 39 and mentoring from BALTIC Professor and Turner Prize-nominated artist Christine Borland. Ramona is looking forward to moving into the North East’s artistic community. She said: “I have heard it is an incredibly vibrant place for the arts. I cannot wait to explore the North galleries. Just from looking at the mix of architecture in Newcastle I have a feeling the arts may be more individual than anywhere else. The second prize, worth £9,000, named after Mr Woon’s late mother Lim Ai Fang, was awarded to Emilie Atkinson, Slade School of Fine Art, University College London. The £6,000 Cheong Kam Hee Art Prize, named after Mr Woon’s father’s late second wife was presented to Sam Baker, Kingston University. The competition judges split an additional consolation prize of £5,000 between two artists: Catherine Ross, Gray’s School of Art, Robert Gordon University, and Eleni Odysseos, University of Leeds. 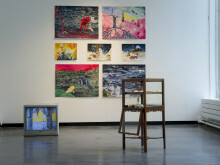 The Woon Foundation Painting and Sculpture Art Prize was established to provide opportunities for students to develop their fine art practice, offering direct links with the cultural sector through Northumbria’s partnership with BALTIC Centre for Contemporary Art in Gateshead. Mr Woon added: “I am delighted to offer this career-changing opportunity to such a gifted young artist. Ramona’s residence in BALTIC 39 will allow her to actively engage with the rich North East art community. 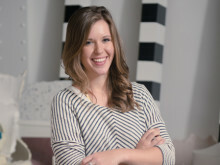 Holly Hendry, last year’s winner, completed her Woon fellowship this summer but she credits the prize for providing her with a unique opportunity and platform to develop her practice. 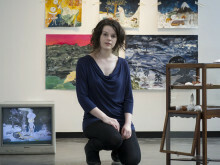 Since winning the prestigious award and studio space in BALTIC 39, the 24-year-old has exhibited work in Northumbria’s Gallery North. Her work has also been displayed at The Royal Standard in Liverpool, The Bank Gallery in Whitechapel, London, and by the Sharjah Art Foundation in Sharjah, United Arab Emirates. Members of the public will be able to see the pieces she has produced during her residency at her solo show, Hollow Bodies, in Gallery North, which opens on the 24th of September and runs until the 15th October. All of the winning and shortlisted artworks are currently on display at Gallery North, Northumbria University, Sandyford Road, 10am-4pm weekdays, until September 19th. 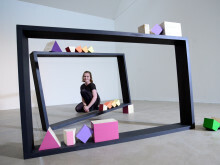 Entries for the 2015 Woon Foundation Painting and Sculpture Art Prize are now open. For more information, visitwww.northumbria.ac.uk/woonartprize.